Why am I getting the "R6030 - CRT not initialized" runtime error on my Lenovo Windows 7 computer? The same error may come out multiple times. 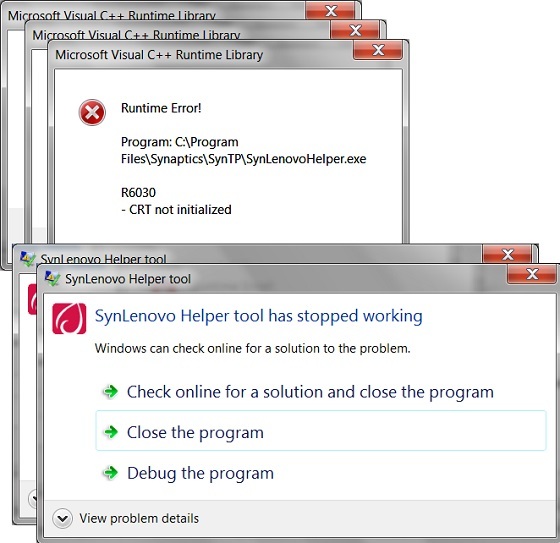 Then another error box is displayed: "SynLenovo Helper tool has stopped working". And this error box may come out multiple times too. The problem is caused by incompatible DLL libraries between the "SynLenovo Helper tool" and the Windows system. "SynTPEnh Caller Service" is a Windows 7 service provided by SynTPEnhService.exe program file. One way to solve the problem is stop and disable the "SynTPEnh Caller Service - SynTPEnhService.exe" service, instead of troubleshoot which DLL library is causing the problem. So run "services.msc", stop and disable "SynTPEnh Caller Service - SynTPEnhService.exe" service. The problem will go away.